The downward trend still looks to be intact and the charts are looking fairly bearish, with some key moving averages starting to show some ominous signals. The FTSE has bounced off its 200 day moving average twice recently, visiting the 5720 level yesterday and last Friday. Meanwhile, the DAX is on the verge of seeing a bearish cross of its 20 and 55 day moving averages, whilst the Dow has already seen this cross and is below its own 200 day moving average. Considering the daily charts for the FTSE and DAX, it really looks like the markets have failed at their highs too many times throughout the summer. Each time there's a bit of momentum behind the buyers, they just seem to dry up. So far we have yet to see a November rally, certainly for US indices at least, and big question marks are being raised as to whether we will see any sort of Christmas rally at all. Dark clouds are overshadowing the markets and continue to keep the bulls at bay. The uncertainty over what will be done about Greece and the US fiscal cliff is really hampering any rallies, even though there are plenty of investors who think that equities are currently good value. Whilst the bears are in charge once again this morning, the FTSE is at least opening a little higher than we were calling it earlier on. At the time of writing, the FTSE is showing tentative signs of life at 5760, but is still 25 points in the red nonetheless. 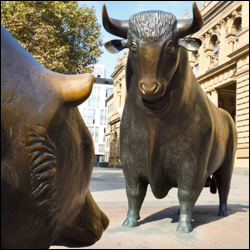 There was a glimmer of hope for the bulls yesterday, as they managed to drag the index into positive territory at the very death of the session. However, last night's weakness in the US has poured a bucket of cold water on their optimism. The 5720 level is now seen as a very important support level for the FTSE. As mentioned, not only is it where the 200 day moving average currently sits, but the index has bounced off it twice in the past few days.